A major interest of mine is science that is accessible to the young – making it more doable. Fun. 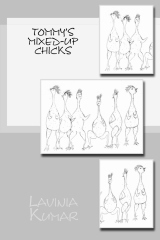 So read Tommy’s Mixed-up Chicks!! If you like science mixed up with weird humor and fantasy, read this book written and illustrated by me! Find out what can happen with an old X-ray machine, a microwave and a… well, not really (perhaps) dead chicken. Tommy and his father start simple, but that’s not how it ends. How would you like six naked chickens running around your farmyard? Buy from Barnes & Noble, Amazon, and Kindle.